It’s been a hard couple of weeks for America. I’ve been glued to the news and checking on my loved ones for the last couple of weeks. My heart goes out to everyone who has been affected by these natural disasters. This week I’m teaming up with a bunch of awesome food bloggers to help bring awareness to charities that are helping with the devastation Texas is going through (I’ll be doing another blog post about those suffering through Hurricane Irma next week). 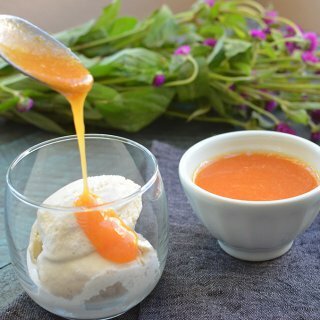 We are all posting a Texas themed/styled food and posting a link to a reputable charity. The charity I would like to bring awareness to is the Houston Food Bank. My grandpa was born and raised in Houston and always spoke longingly of his hometown. While I was figuring out what recipe I should create for this post, I thought of all the different recipes he would make when I was younger. 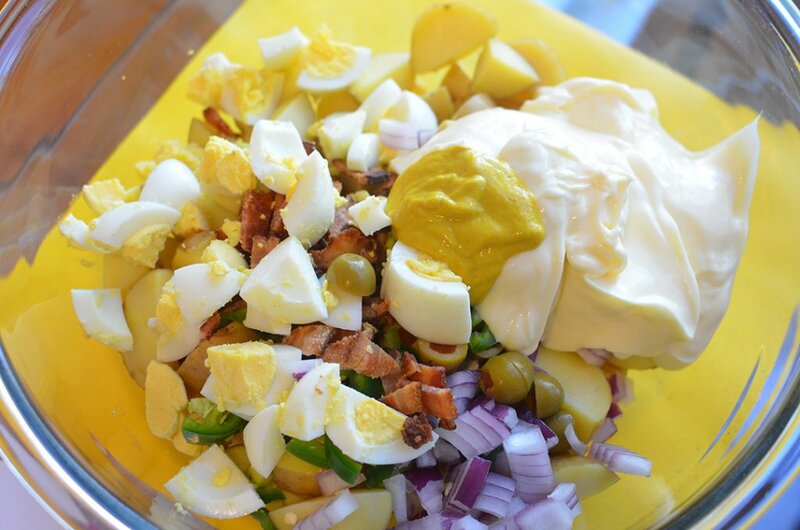 One of the recipes that stood out was the potato salad he would make every summer. I made a couple of changes to it, but overall it stands true to my grandpa’s. 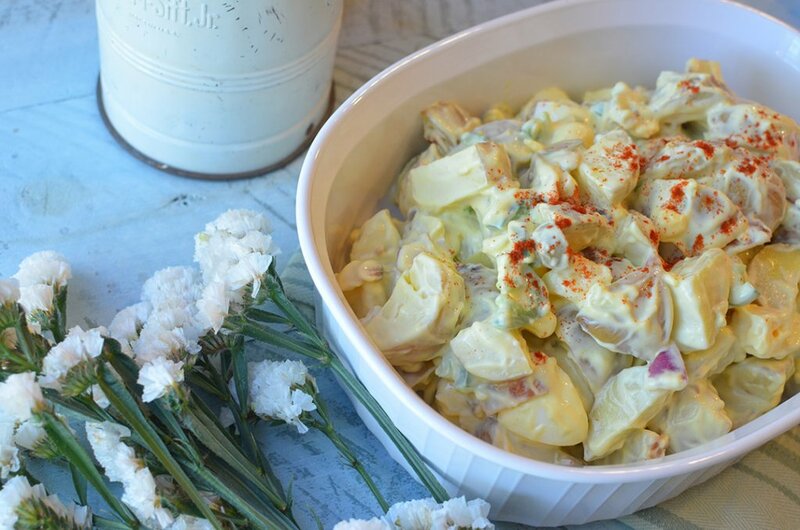 This Texas style potato salad is chunky and certainly has a kick! My grandpa would always put olives in his potato salad, and I love using green olives for a bit of pucker. If you prefer black olives, feel free to switch them out! They both work wonderfully. Jalapenos bring this dish to a whole new level and are sure to charm the spicy lover in your life. I’ve separated a small portion of this salad out for the kids (or anyone who doesn’t like spicy flavors) and omitted the jalapenos and red onions. My kiddo loves it. Throw everything together and mix well for a chunky salad that will surely be a hit at any family gathering! 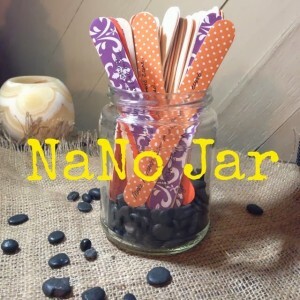 This would go absolutely perfect with BBQ! 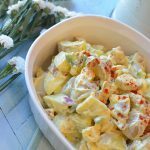 A chunky style potato salad with a spicy kick! In a large pot, add the chopped potatoes and enough water to cover them well. 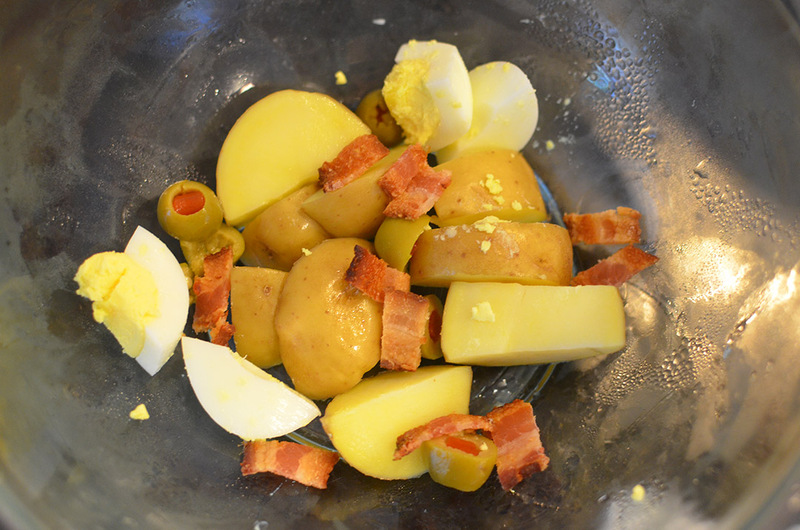 Bring to a boil and cook for about 30 minutes or until potatoes are tender. Drain the water and allow potatoes to cool. While potatoes cool, prepare the rest of your ingredients. 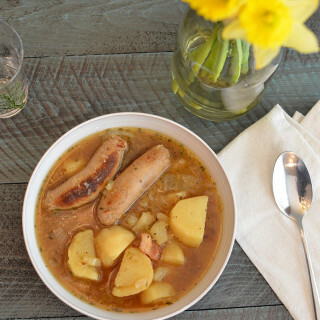 In a large bowl, combine all ingredients with the potatoes. Mix well. Refrigerate until needed or serve immediately. I hope you enjoy this dish and make it your own! Feel free to make any changes you would like. If you can, please make a donation to the Houston Food Bank or any other reputable charity to help those in need. Also check out the other wonderful food bloggers who are participating in this event! 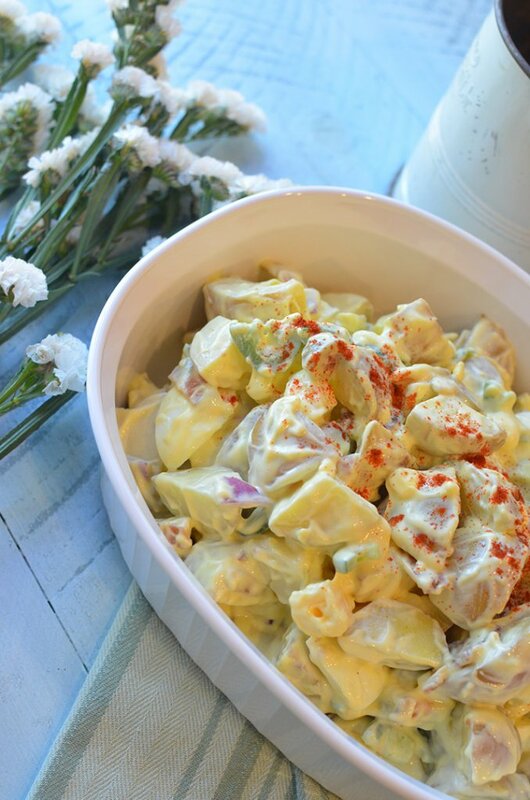 What a great sounding potato salad. 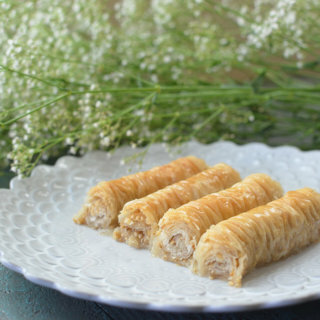 I love recipes that are handed down through generations. Thank you Wendy! It certainly makes a dish much more special! 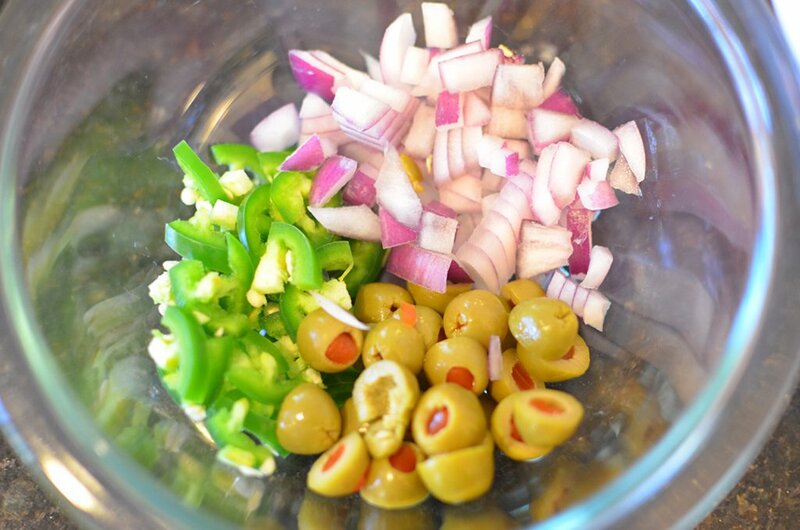 I’m definitely putting jalapenos in my next batch of potato salad! What a great tribute to Texas and your grandpa! Japalepnos seriously bring the salad to a whole new level! It’s so good! Love the addition of green olives. I would have never thought of that. Thanks Jenne! 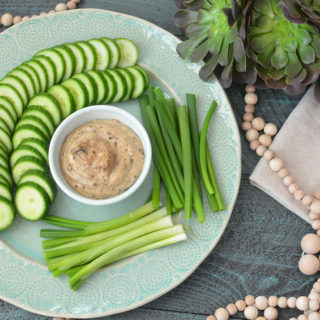 I love green olives so the more I can use them the better! 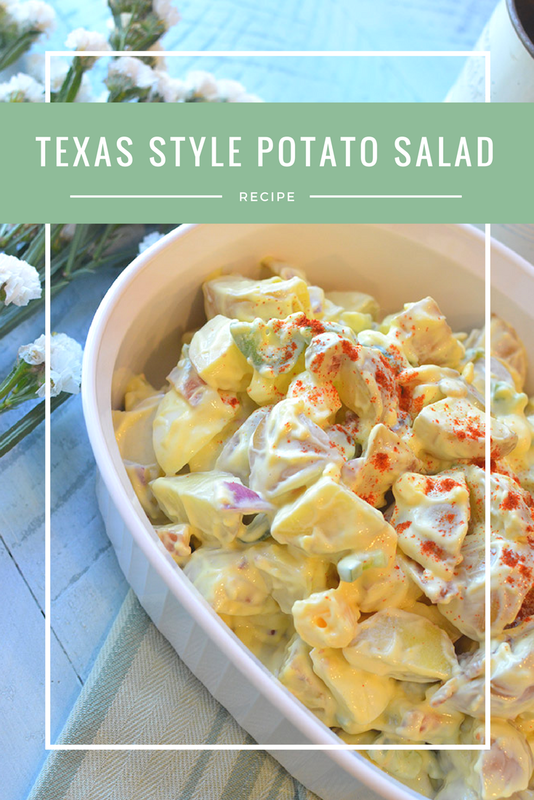 I love the addition of olives and jalapenos to make your Texas style potato salad special and unique! Thanks Val! They’re quite a tasty addition!